I recently watched Robocop, a 2014 film directed by José Padilha which treats cyborgs and the ascendance of robots in contemporary culture. 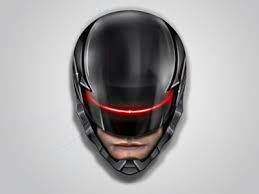 An earlier film named Robocop was directed by Paul Verhoeven in 1987. I have not seen that version, which many reviewers at IMDB.com find vastly superior. Fortunately, I won’t be distracted in my analysis of Robocop (2014) by the earlier version, although I must say that I am now anxious to watch it—better late than never! On the surface, Robocop (2014) may seem to be just another action flick with a touch of science fiction thrown in for good measure. Cyborgs were depicted in other movies (aside from the original Robocop) such as the Terminator series (starring Arnold Schwarzenegger) long before they were anything close to being a reality. By 2014, the science treated was no longer fiction at all. Drones are here and being used to spy on and kill people all over the planet. Other types of robots have been used to check areas for land mines and IEDs, and also for other military applications. 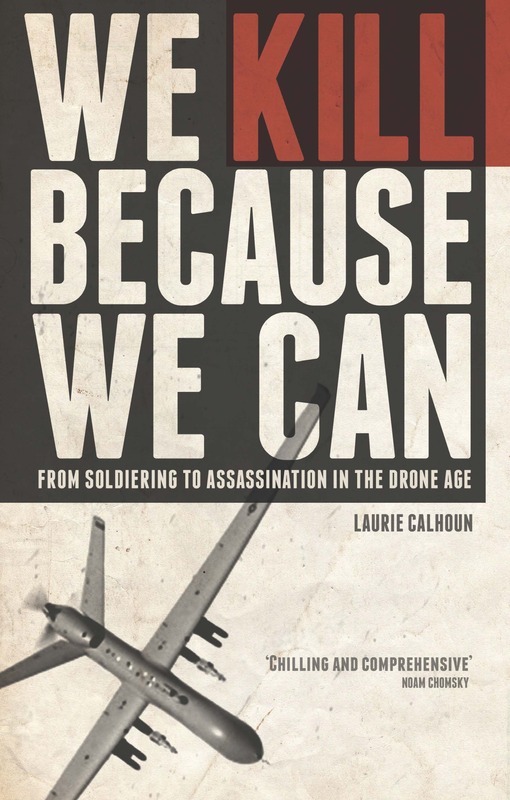 This film raises a number of important questions about the use of unmanned systems. The primary plot dispute is whether cyborgs should be used in the US homeland to save the lives of policemen, just as drones are being used abroad to avoid having to put “boots on the ground” and to obviate the need for manned bombers. 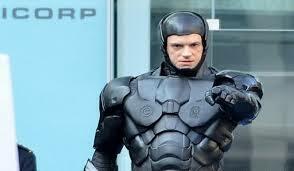 The manufacturer of cyborgs in Robocop (2014) is a company called “OmniCorp”, based in China. This is a diaphanous jab at China’s recent economic ascendance in reality, but also the growing trend of private military companies (PMCs) setting up shop abroad to avoid paying US taxes. Omnicorp is enthusiastically supported by a Fox News Network-type pundit, Pat Novac (played by Samuel Jackson in a hairstyle reminiscent of James Brown). Novac argues à la Sean Hannity in an obvious effort to convince viewers that their lawmakers should rescind a reigning prohibition on the use of cyborgs in the homeland. Senator Hubert Dreyfus, the author of the Dreyfus amendment, is the arch opponent of the use of cyborgs on US soil, and up until now his position has been supported by the populace, who follow his lead in insisting that “the human factor” must remain in tact whenever lethal weapons are in play. If a cyborg mistakenly kills a child, it will feel nothing, and that is the fundamental problem, according to supporters of the Dreyfus amendment. How can delicate matters of life and death be delegated to a machine? The head of OmniCorp, Raymond Sellars (played by Michael Keaton), naturally wants to change public opinion so that his company will become even wealthier and more powerful than it already is. The firm commands enormous contracts for cyborgs used in many other places around the world, including Iran, where the robots are shown scanning Iranians to locate threats in a manner reminiscent of Nazi roundups under the Third Reich—or US round ups during the occupation of Iraq. The procedures are broadcast back home to share with the citizens paying for the practice the “good” their government is doing on the other side of the globe. When mistakes are made, the channel switches abruptly to more palatable topics, just as in reality, where US military interventions abroad are sanitized by the mainstream media. 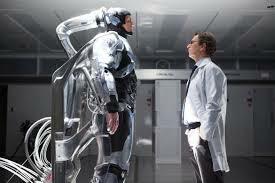 Heeding the poll data, Sellars sets out with his trusty company scientist, Dr. Dennett Norton (played by Gary Oldman), to create a cyborg-human amalgam, using a man, Alex Murphy (played by Joel Kinnaman), who has been nearly destroyed by a car bomb. All that remains of Murphy is his brain, one arm, and his lungs. He is the perfect guinea pig for the creation of a cyborg-human amalgam, which will function as effectively and be as lethal as a robot, but still retain the sentience of a human being and therefore not be illegal under the terms of the Dreyfus amendment. All seems to be going well until details of all of the crimes which Cyborg-man Murphy will be sent out to solve are uploaded to his brain. He becomes emotionally overwhelmed by the ugliness and evil of the mountain of crimes, and his doctors find the need to sedate him by modifying his dopamine levels. Under medication, he becomes emotionally numb to the point where he no longer feels anger or any human emotions and looks more like a zombie than a man as he goes out to find the people on his list of wanted suspects. He walks right past his wife and son as though they do not exist, for he is focused singlemindedly on fighting crime and cannot be bothered with anything else. The doctors soon recognize that they cannot allow the human element of Murphy to be functional when he is on duty, because his judgment may be clouded by strong emotions. They ingeniously devise a means by which to make him fully robotic during the times when he is out fighting crime, while laboring under the belief that he is making all decisions about his actions by himself. In truth, everything has been programmed into him. He only believes that he has free will, which is an illusion. The cyborg-human amalgam turns out to be a failure, but it succeeds in serving as a perfect marketing tool, swaying public opinion to the point where congress agrees to overturn the Dreyfus amendment and permit fully robotic cyborgs to operate on US soil, the argument having been made that if only Murphy had not become obsessed with avenging his own murder, then chaos would not have ensued.